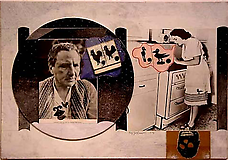 Untitled (Gertrude Stein with 50's Kitchen), 1975. Collage on illustration board, 16 x 23-1/4 in. Richard L. Feigen. Untitled (I Shot an Arrow Book Cover), 1979. 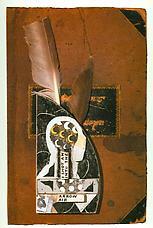 Collage: ink, paper, feathers on book cover, 14 x 9-3/16 in. Richard L. Feigen. 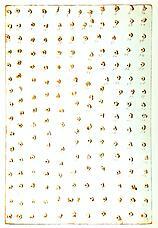 White Painting with Holes and Numbers, 1951-1960. Collage on cardboard, 11 x 7-1/2 in. Richard L. Feigen. Mind Games: Ray Johnson’s Art of Ideas presents work form the Estate of this protean artist never before seen, and shows some of the most important ideas in post-war art through the lens of a unique imagination. Focusing on the conceptual references and content in Johnson’s work over three decades, this exhibition reveals the complete body of work – collages, mail art, texts, drawings – to be part of the same aesthetic project. The exhibition begins with a review of his early, well-known pre-pop collages which incorporated images of movie stars. Subsequent sections are arranged thematically to show Johnson’s multiple approaches to visual content. “Zen” presents work which responds to the ideas John Cage introduced him to concerning the workings of chance operations as a part of the artistic process. “Language” illustrates Johnson’s interest in semiotic systems and poetics, and shows the incorporation of this material into work, which would be prophetic of contemporary practices. With “Re: Stein/ Duchamp/ Cornell” Johnson is in a dialogue with three of his most important sources of inspiration. “Physical Correspondences,” “Fluxus/Gutai,” “Networks,” describe the visually linking of objects and ideas in graphic systems and the creation of new meaning from unexpected juxtapositions of shape and form. Johnson’s life and art merged seamlessly; every encounter, each conversation was conceptual material for the art. He was a “master of the deadpan gesture,” and a pioneer in the postmodern idea of arts and medium as interchangeable entities. Mind Games: Ray Johnson’s Art of Ideas presents new aspects of this complex artist whose work has only begun to be explored. Excerpted from the press release.